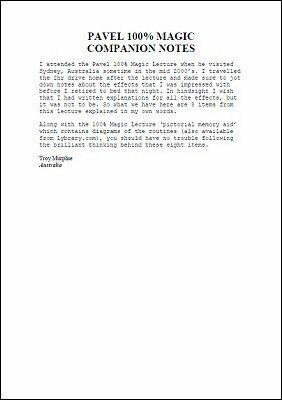 I attended the Pavel 100% Magic Lecture when he visited Sydney, Australia sometime around 2005. I traveled the 2 hr drive home after the lecture and made sure to jot down notes about the effects that I was impressed with before I retired to bed that night. In hindsight I wish that I had written explanations for all the effects, but it was not to be. So what we have here are 8 items from this lecture explained in my own words. Along with the 100% Magic Lecture 'pictorial memory aid' which contains diagrams of the routines, you should have no trouble following the brilliant thinking behind these eight items.